There are three requirements you must meet prior to placing a bid on a property listed on EnergyNet.com. First, you must have a valid, active Buyer account. If you don't yet have a Buyer's account, register as a buyer. Next, you must agree to the Buyer's Agreement. After you create an account and log into the site as a Buyer, you can review and digitally sign the Buyer's Agreement on your Buyer's Homepage. Finally, you must have an adequate bid allowance for the lot you wish to bid on. You can see your bid allowance and request an allowance or increase your allowance on your Buyer's Homepage. After you complete the buyer registration process, provide the necessary documentation and establish a bid allowance, you will be notified by email as soon as you are eligible to bid or make offers on properties. Properties which are currently available for auction can be found on the Property Listings page. You must be logged in to view the Property Listings page. If you try to access the page without logging in first, you will be prompted for your account credentials. By default, auctions that are currently within their bidding period will be listed at the top of the Property Listings page. When applicable, such as when the listings are sorted by the closing time and date, lots will be grouped in subcategories such as, "Ending Tomorrow," and "Ending This week." 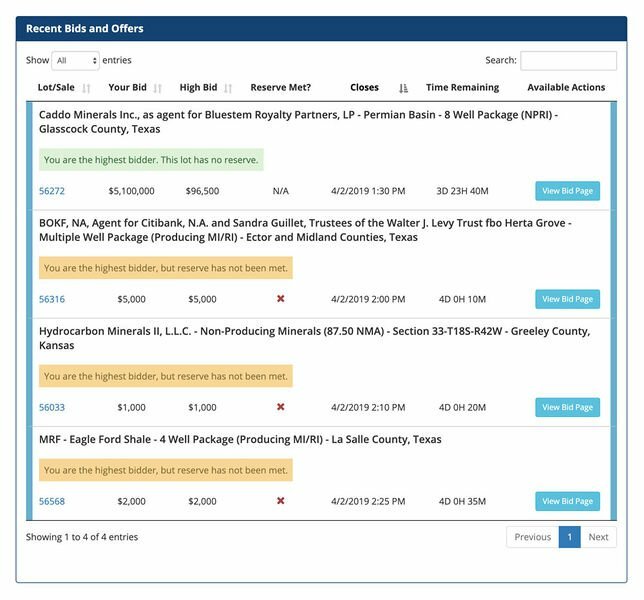 You may also sort the display of auction properties by clicking the "Lot," "High Bid," and "Closes" column headers. Use the "Instant Search" box to instantly filter all currently listed properties. 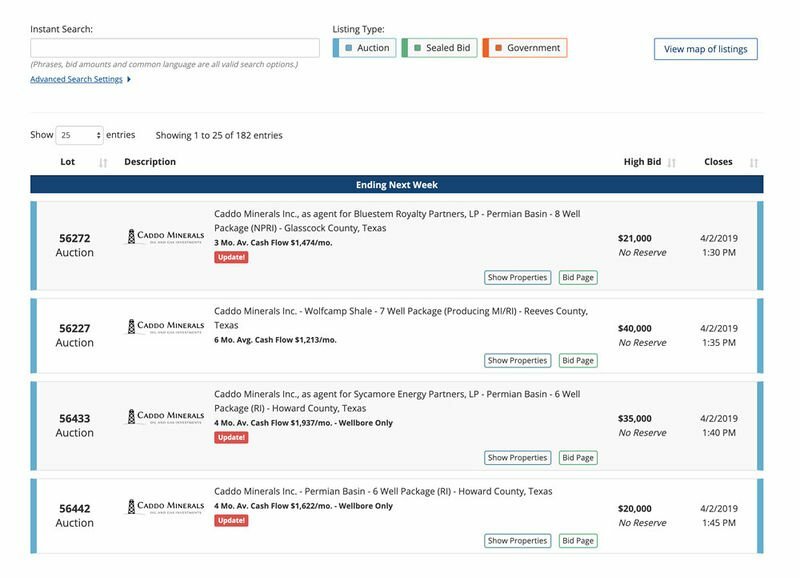 Simply click in the box and begin typing a seller name, such as "Chevron," a lot number, a date, or any information that appears in the auction listings. You can also click the "Advanced Search Settings" below the search box to quickly tailor the listing to your immediate preferences based on interest type, seller, operator, and location. A sample of the Property Listings page. The listings can be sorted by clicking the column headers. You may also use the search options to instantly filter the listings. All bids entered on an auction property are treated as a Maximum Bid. This entered amount should be the highest amount you are willing to pay. 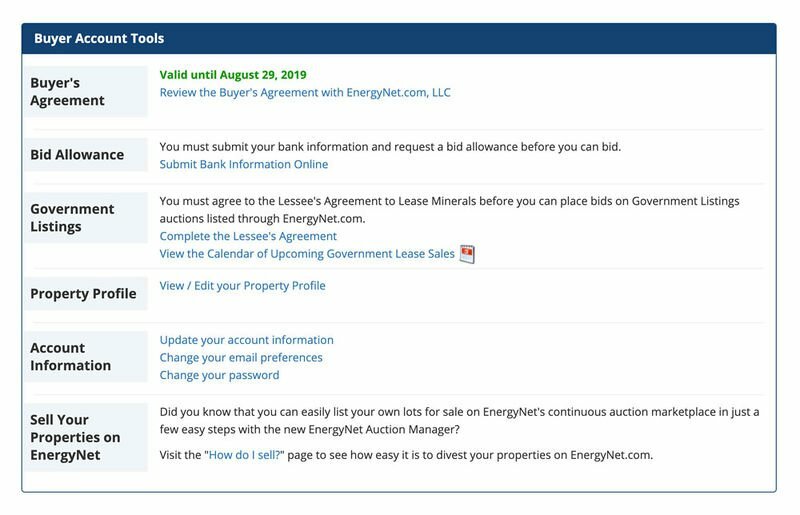 The EnergyNet auction engine will bid automatically on your behalf, up to the amount you specify. Your Maximum Bid amount always remains confidential, both during and after the auction. For example, let's say you would like to bid on a property with a current high bid of $300 and a bid increment of $100. If you enter a Maximum Bid of $1,000 on this property, a new bid will be placed automatically at $400, the next minimum increment, to make you the new high bidder. The system will then continue to increase your bid whenever you are outbid. The system will only bid up to, and including, the $1000 limit you specified. The Maximum Bid mechanism is an invaluable tool to maintain your bidding status. Because it operates automatically, based on the parameters you set, you don't have to be active during the auction to participate, and you don't need to manually place flat bids. This feature can be very important when bids begin to increase faster than you can respond manually. Some properties require that you agree to additional terms and conditions before you place a bid. You'll be given an opportunity to review the additional terms and conditions, and then accept them on the bid page. When you are ready to bid, go to the bid page for the property you wish to bid on. When you reach the bid page, confirm that you are logged in with the Buyer account that you intend to bid with. Your Bidder Username is listed in the bid box. The next possible bid increment is filled into the "Your Maximum Bid" box. This property's bid page requires the bidder accept additional conditions. Check the boxes and click "Submit" to indicate your agreement. You will not be prompted again after you agree. The bid page shows the Bidder Username you are logged in with and gives you information about your bid status. To ensure a secure transaction, you will be required to confirm your Buyer account password before placing your bid. Enter your password and bid amount. Critical note: It is important that you take precautions to enter the correct amount you wish to bid. Bids cannot be retracted once they have been submitted and have affected the auction! The winning bidder will receive an email notification after the auction closes. As soon as you have entered your bid, you will immediately receive confirmation about your bid and how it has affected your standing in the auction. A green status message will appear above the bid form if the bid was successful. Bid information is updated across the EnergyNet website instantly. You will receive email confirmations after you have placed a bid, when you have been outbid, and when you are the winner of an auction. You may update your email preferences from the Buyer's Homepage to enable or disable these emails. What if I am immediately outbid? When you enter a bid, you may be immediately outbid by another bidder. This happens when another user's existing Maximum Bid is greater than your Maximum Bid amount. In that case, a bid that is one bid increment higher than your Maximum Bid is entered on behalf of the other user. In the event that you enter a bid amount that is the exact value of another user's previously-entered Maximum Bid, the first bidder to enter that amount will become the high bidder. When this happens, as long as there is still time left in the auction, you may submit a higher bid. Where can I check my bid status? There are several ways to check to see if you are the high bidder in an auction, or if you have been outbid. The bid page, property information page, and the Buyer's Homepage all show your bid status. You can edit your Account Profile to set your email preferences for receiving bid confirmations and outbid notices. Please note that email can be delayed or filtered for a variety of reasons. Please log in to the website to get an up-to-date bid status. 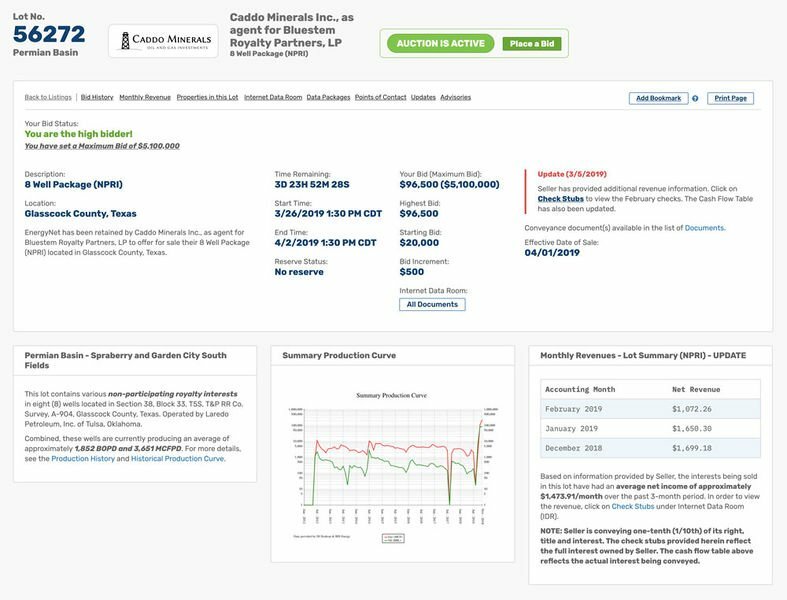 The current high bid, your maximum bid, and the status of the property's Seller reserve price are all shown near the top of the bid page. In this example, the green status indicates this bidder is the high bidder. The "Highest Bidder" listed in the status table also confirms the current high bidder. The property information page for the property you have bid on is an easy place to monitor the status of an auction. Near the top of the page, you can see "Your Bid Status" as well as the current "Highest Bid." Auction status is displayed in the top box of the property information page. You can keep track of all bidding events by looking at the bid history table on the bid page or property information page for the property you are bidding on. Bid history tables on the property information and bid pages list the most recent successful bids. Your Buyer's Homepage contains a table called "Recent Bids and Offers." This table lists all of the properties you have bid on, including your current bid amount, the current high bid, reserve status, and the closing time of the property. Bid information is updated across the EnergyNet site instantly, but you must "refresh" your web browser to see current results as time passes. Your browser will not automatically refresh the bid history tables, auction status or other events. The information you are viewing is only as current as the last time the page was loaded or refreshed. 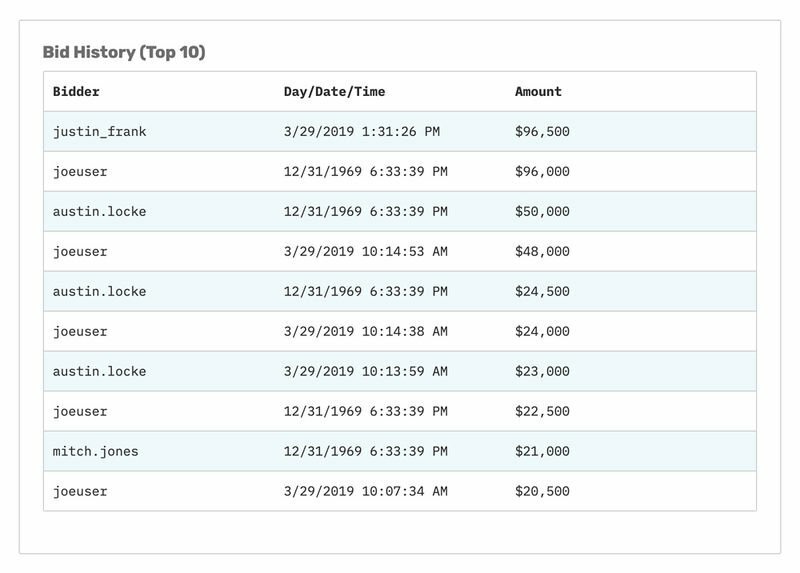 For instance, if you load the property information page and look at the bid history table, you will only see bids that were entered on or before the moment you loaded the page in your web browser. If you wish to see if new bids have been entered, you must refresh the page. Modern web browsers can be refreshed by pressing the F5 key on your keyboard while you are looking at your browser. You may also click the "refresh" or "reload" button at the top of your browser. Below are examples of modern web browsers and the location of the refresh button. The high bid at the end of the auction period is a valid and binding offer, even if the seller's minimum reserve price is not met. The seller has the option to accept, reject, or counter any offer that has not met the reserve price. As in any negotiation, the buyer can increase the offer, stand firm, or reject the counter offer from the seller. In the event the seller's reserve has not been met it is EnergyNet's protocol to negotiate with the high bidder and the seller to attempt to reach an agreement. Should the negotiation be unsuccessful the second highest bidder will be contacted for negotiation and so on until the property is sold or the sale is cancelled. Losing bidders have no obligation to negotiate for the property if the high bidder and the seller cannot come to an agreement. After the high bidder for the property has been determined EnergyNet will send an invoice and will use the bidder registration information to complete the conveyance documents. After the funds are received in full and all contractual obligations (i.e. preferential rights, consents to assign, etc.) are waived or exercised and all regulatory fillings (change of operator forms, etc.) are complete EnergyNet will send the conveyance documents for recording and then send the buyer and seller recorded copies.